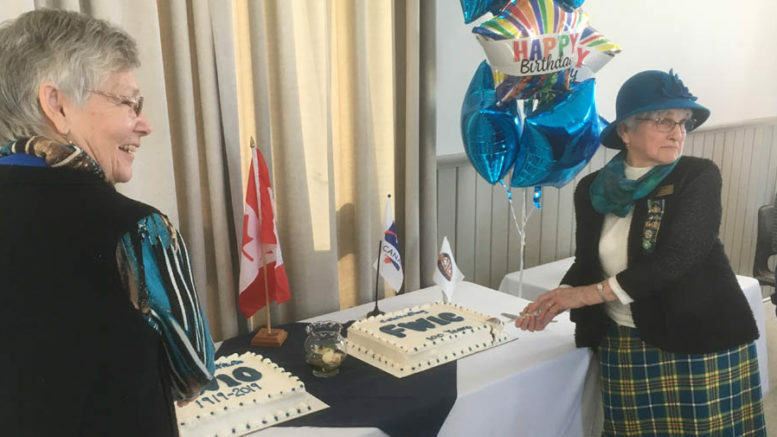 The Prince Edward District Women’s Institute (PEDWI) celebrated the centennial of the Federated Women’s Institute provincially and federally Tuesday, but it gave most of its birthday presents to the community. About 25 members gathered in the Ameliasburgh Town Hall 100 years after the federations were formed to celebrate with dignitaries from the organizations and other community members. The gathering also took place on the same date the initial Women’s Institute first met. “It’s so good to see you all come. This was a dream of mine to have a tea for our Women’s Institute and the national and provincial levels, because they’re both 100 years old,” said PEDWI president Evelyn Peck, who is also a past-president of the Federated Women’s Institute of Ontario (FWIO). Peck said the Women’s Institute was first formed in Stoney Creek, Ont. in 1897 as an organization to educate rural women, to broaden their expertise in domestic science and agriculture, and to offer an opportunity to contribute to the public good and socialize with other like-minded women. Soon, with help of the Ontario Department of Agriculture, it spread quickly. In Prince Edward County, the first branches were organized in 1908 and one year later more than 400 women were involved in service. Peck said the W.I. remains vibrant and healthy today with thousands of women, both rural and urban, pooling their ideas and resources to act locally, provincially, nationally, and even globally. “We continually try to make a positive difference in our community,” Peck said. FWIO president-elect Mary Shortt, of Codrington, said she has seen firsthand the work PEDWI has done and she commended the local members for their engagement. “I’d like to thank the PEDWI for their hard work and constant support for their communities all over the county. I know a lot of the great work they’ve done,” she said. Prince Edward County Mayor Steve Ferguson also brought greetings. He focused his comments on the PEDWI’s efforts to promote accessible transportation in the community. As of this year, he said the local district had raised more than $115,000 for the effort. In honour of the anniversary, the PEDWI offered the FWIO and FWIC cheques to help with two museums that recognize its history. The first was the Erland Lee Museum in Stoney Creek. It recognizes an influential man who used his family’s influence in municipal government and society to form the world’s first rural women’s organization that grew into the W.I. and his wife, Janet Lee, who was one of the first organizers. The home hosted a number of meetings and much of the foundational work. Another museum, near St. George, Ont. memorializes Adelaide Hunter Hoodless, a pioneering educational reformer who worked with the Lees in developing the organization. The museum was her childhood home. The FWIC has preserved it since 1959 and it is now considered a national heritage site. – The Prince Edward County Museums. Curator Jennifer Lyons said the money will support public programming. She added the five museums share a “kindred association” with the PEDWI in that both seek to preserve local heritage and history. Lyons said the W.I.’s Tweedsmuir histories are a valued way to tell the story of the communities. – The County of Prince Edward Public Library. Chief executive officer Barbara Sweet said the Library was appreciative of gifts to each of its branches and to the Picton branch expansion fund. She added the PEDWI’s ongoing support helps provide services, programs and community space to multiple generations. – The Quinte Educational Museum and Archives. President Lynda Sommer said the Victoria Schoolhouse on the grounds of the Ameliasburgh Heritage Village offers a glimmer of what school was like in 1904 for children and adults alike. The funding will provide for ongoing educational opportunities. – The Prince Edward County 4-H Association. Representative Lynn Ward said the Women’s Institute has been “a big part of 4-H since they’ve been around” and has helped enormously in the past. The funding will help with educational opportunities for about 90 youth form ages 6-21. – The Royal Canadian Air Cadets 851 Prince Edward Squadron. Training officer Mike DeCastris said the continued support will help training and leadership activities for youth aged 12-18. He said the donations will help give more opportunities and better experiences to those cadets and hopefully, over time they’ll mirror the W.I. members in their desire to better themselves and give back to their communities. – The Prince Edward Point Bird Observatory. Representative John Hirsch said “It’s really nice to see the importance of science recognized by your organization.” As the observatory is completely run by donations, Hirsch said the PEDWI’s generosity will effectively support nature programs in an important migratory bird area.